Over time, the reputation of the Strand’s quiz has grown; it has become as much a part of the store’s identity as its canvas tote bags. NEW YORK — As Jennifer Lobaugh arrived at the Strand Bookstore to apply for a job this spring, she remembered feeling jittery. It wasn’t only because she wanted a job at the fabled bookstore in Greenwich Village, her first in New York City, but also because at the end of the application, there was a quiz — a book quiz. The Strand is the undisputed king of the New York City’s independent bookstores, a giant in an ever-shrinking field. It moves 2.5 million books a year and has around 200 employees. 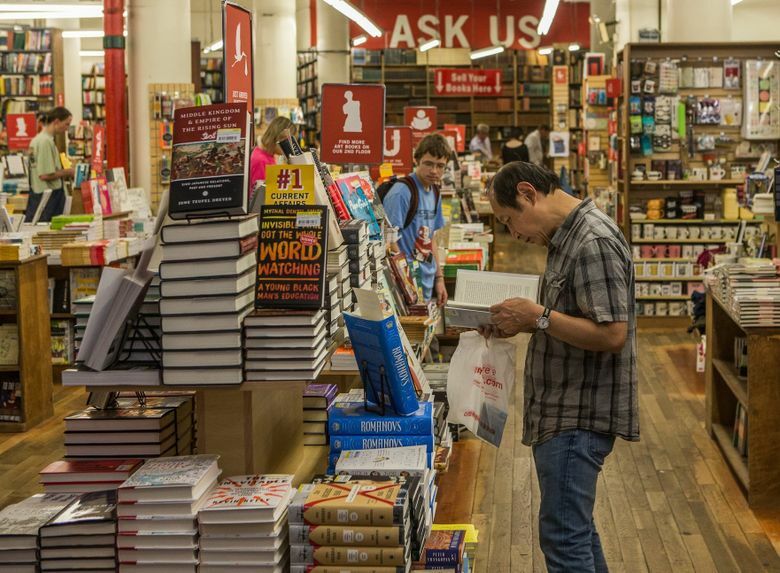 While its competitors have closed by the dozens, it has survived on castaways — from publishers, reviewers, the public and even other booksellers. For nearly a century, the downtown bookstore has symbolized not only inexpensive books, but something just as valuable: full-time work for those whose arcane knowledge outweighs their practical skills. “Ask Us,” says a big red sign on the walls of the Strand. The starting wage is $10.50 an hour, with health benefits in 60 days and union representation. There are unwritten perks, including discounts, a casual dress code and brushes with celebrity. A job at the Strand has also offered generations of newcomers, like Lobaugh, originally of Ponca City, Okla., something like instant New Yorker status. Employees are known for being “curmudgeonly” but also clever, even cool: Former employees include rock legend Patti Smith and the writer-critic Luc Sante. For about four decades, however, applicants have confronted a final hurdle to enter its ranks: the literary matching quiz. Over time, the reputation of the Strand’s quiz has grown; it has become as much a part of the store’s identity as its canvas tote bags. The legend has become larger, in fact, than the quiz itself, which is only 10 lines long, covering a few inches of the photocopied application. Still, the stakes feel high. About 60 people apply for a job every week; typically only a couple are hired. The booksellers scuttling across the 10,000-square-foot main floor are not the only ones required to face the quiz. Members of the Books by the Foot team, which assembles collections for television and film sets, have to take it, too, as do new workers at Strand satellite shops. Even warehouse workers must take the quiz. The Strand was founded in 1927 when Fred’s father, Benjamin Bass, a son of Lithuanian immigrants, became enamored of books during his lunch breaks from a fabric store job on Fourth Avenue, then known as Book Row, and decided to open his own bookstore. The Strand moved to its current location, at Broadway and 12th Street, in 1957. A paper application appeared around 1965; the quiz was added in the 1970s. “I thought it was a quick way to find if somebody had any knowledge of books,” said Bass, who, at 88, still works at the store part time. Bass has forgotten precisely when he invented the quiz, but the second-longest-tenured employee, Ben McFall, 68, recalls taking it in 1978. McFall later helped write the quiz. In recent years, much has changed at the Strand. The motto went from “8 miles of books” to “18 miles of books” after an expansion in 2005. The store added miles of merchandise, too, from a Strand-branded hat line to Moleskine notebooks. Perhaps most significantly, for broiling employees, the place finally got central air-conditioning, also in 2005. For about three decades, Bass presided over the quiz, tweaking it now and then. In 2005, a manager named Carson Moss took over hiring duties from Bass and his daughter. “I tried to modernize it and diversify it,” said Moss, who had studied English literature at the University of St. Andrews in Scotland. He kept the format — 10 book titles, 10 authors, one trick question — but “The Stones of Venice” was removed, replaced by the likes of “White Teeth.” “Being and Nothingness” vanished; “The Tipping Point” appeared. “You have to have titles that are well-read,” Moss said. Recently, another manager, Constance Fox, took over hiring, and the quiz. Fox, who majored in English literature at San Francisco State University, has worked at the Strand for five years. Fox said it was “an interesting challenge” to represent the scope of authors, let alone all human knowledge, noting that the quiz focused on literature and “doesn’t cover all of the second floor” of the Strand — art, architecture, erotica and children’s books (which, it should be noted, are on opposite ends of the floor). If the Strand’s literary quiz has been bound into its culture, so has finding ways to cheat on it. These days, would-be Strand employees can use their smartphones, searching for the authors of books in the quiz. How many accurate matches an applicant must make has always been a closely guarded secret. What is the minimum score to be hired? Moss, the quiz innovator, would not say. He would only say that management takes the quiz “not very” seriously. But that doesn’t mean the quiz is unimportant. Sometimes, Fox said, it can make all the difference.